Seasoned professionals, marketing experts, digital pros and award-winning designers collaborate for you. Count on us to challenge the status quo. Rely on us for a marketing strategy and brand program that deliver ongoing response. We’ll listen hard. We’ll lead and guide. Work with our marketing brains and creative souls. Optimize your brand. Led by Jennifer Larsen Morrow, your team of branding experts is built to deliver extraordinary results. As a marketing strategist and creative thinker, she brings more than 35 years of real world experience to each meeting and every plan. Brand Guru Extraordinaire. That's what I have to say about Jennifer. She is one of those rare talents that understands branding like very few others. From her humble agency staffed with A-list talent in McMinnville, Oregon some of the most amazing results have transformed the brands of companies of all types and sizes. 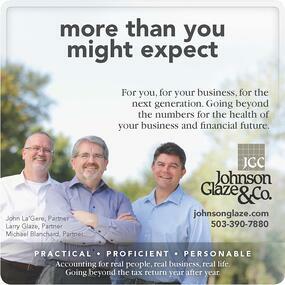 Our work for Johnson Glaze & Co., a CPA firm, defined their message and positioning, created a new look, rebuilt their website, produced ads and created a new context for their growing business. Your team is chosen to fit your budget and achieve your goals. Our talent pool of Oregon brand experts ranges from seasoned professionals to digital-savvy Millennials immersed in design thinking, web development, marketing planning, copywriting, inbound marketing, social media and content development. Take a look at our work. Here you’ll find brands built to last. Brands that rise above the clutter. Brands that come to life in both inbound and outbound marketing, online and offline. To optimize your brand for ongoing response, talk to our branding experts. With more than 40 years of design, marketing and branding behind her, your branding expert, Jennifer Larsen Morrow, can lead a workshop or offer tips, tactics and insights in a keynote talk. Learn more about topics and presentations from your next marketing speaker. Read our review of brand expert, marketing coach or marketing mentor. Which choice is right for you and your business? It could be time to hire a marketing and brand expert rather than live with the symptoms of poor marketing, stale sales and bland branding. Thoughts on our blog. Finding true expertise: we're all branding experts and we're not branding experts. ... interviewed me to find out about our company culture, how I see myself in the community ... This allowed Jennifer to propose several branding options. She introduced the concept of a "brand promise" ... This brand promise is a way for my company to further identify what it's all about ... it's a powerful message to prospective clients and, better yet, a constant reminder to our team every time we see our logo ... this is who we are for our clients.